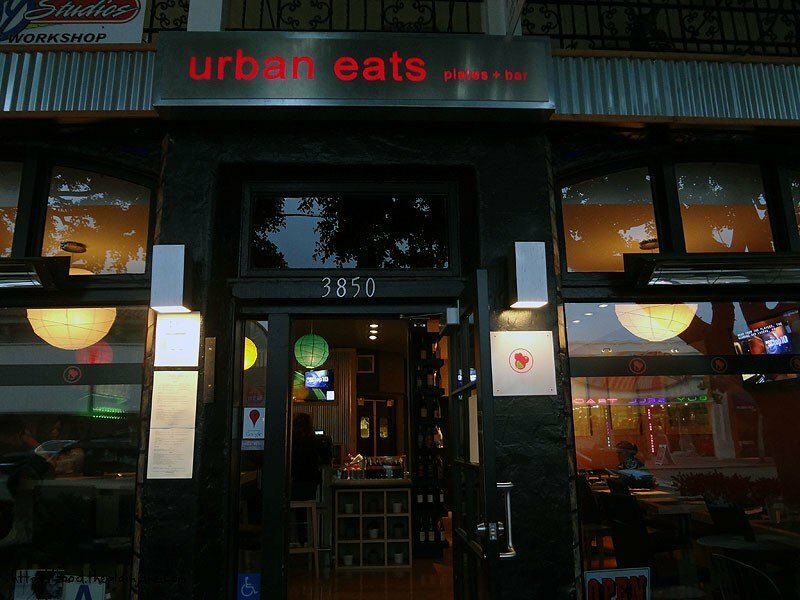 Urban Eats is a new little restaurant in Hillcrest that’s been open for about three months now under the helm of Chef Christopher B. Sayre. 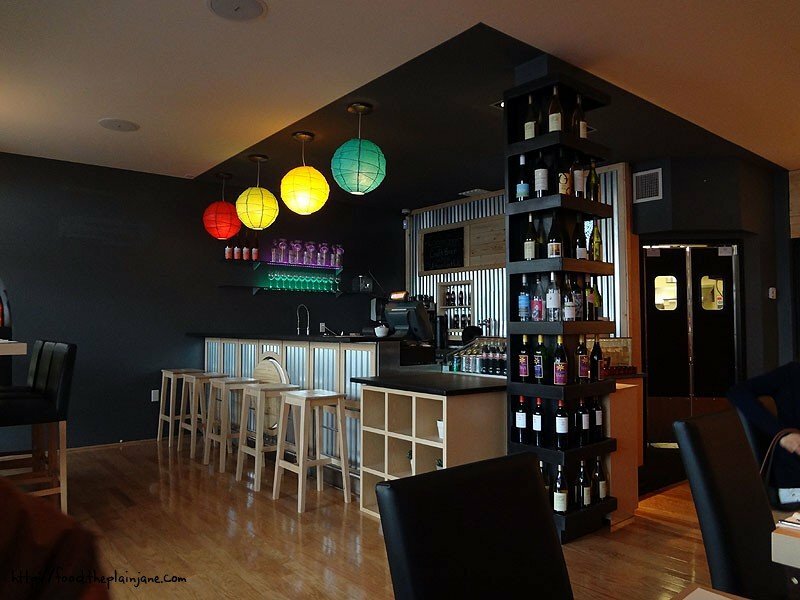 The spot started out earlier this year as Taco Banh before Sayre decided to switch gears and instead open up Urban Eats, a locally sourced restaurant serving up a mix of American dishes. My cohorts and I had noticed on the bottom of our bill it has said “Taco Banh” and curiosity got me to Google searching. It seems Taco Banh didn’t quite work out and Urban Eats was able to rise up out of that. Jake and I are certainly glad that it came to this as we dined here twice within one week – once as a guest and another time on our own with our friend, Laura. Kyle, our host, server, and waiter extraordinaire, was there to take care of us on both visits. His warm and friendly personalities just exudes charm. I loved him immediately, especially when he recognized us on our second visit and already knew we were going to order the macaroni and cheese again. 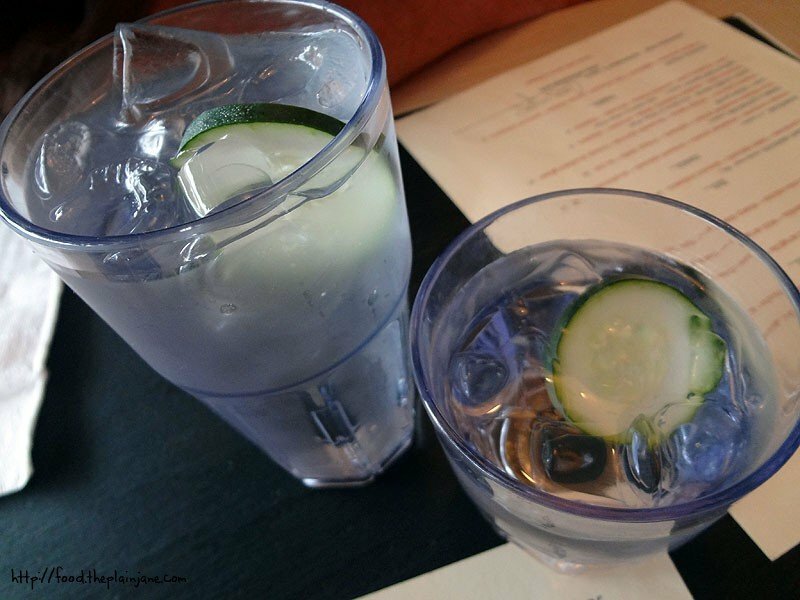 At Urban Eats you get cucumber water, which I love. Jake puts his cucumbers into my glass because he’s weird and doesn’t like cucumbers. All customers get this complimentary appetizer to start. It’s a little more doled up than just “bread and butter” so I call it an appetizer. 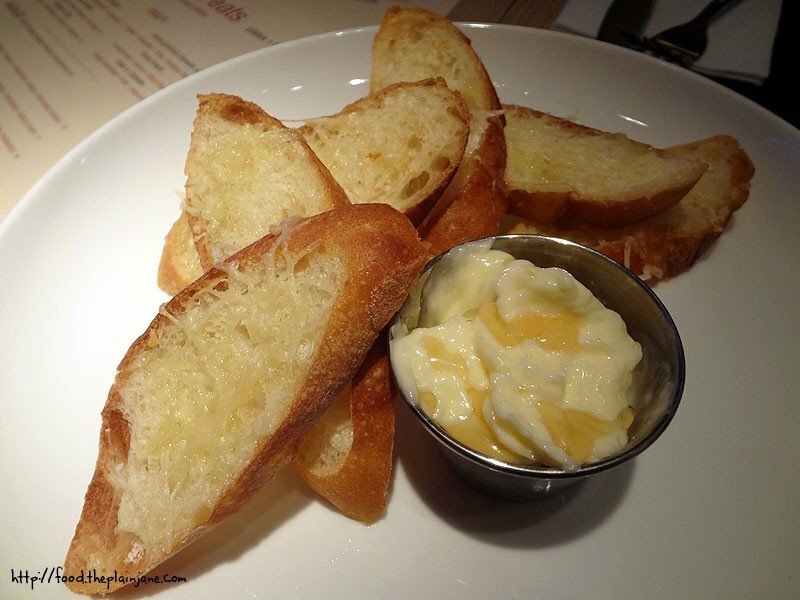 Baguette slices with cheese and a little cup of honey butter greet you shortly after you take a seat, luring you in. The butter has drizzles of honey on it, so the honey is still distinct as you slather it onto a slice and devour it. It’s a yummy way to start any meal. 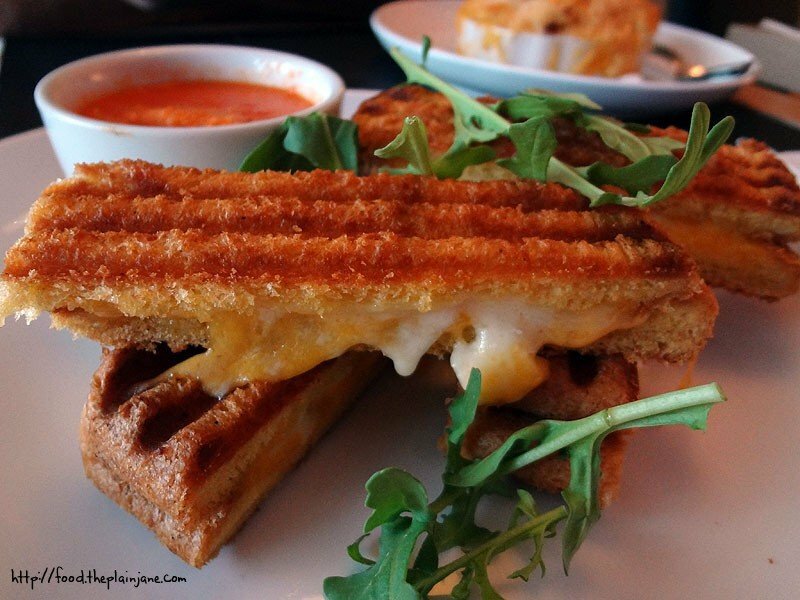 On our first visit, I decided I had to try the Mini Grilled Cheese. The grooves on this appetizer are serious. Super panini pressing was going on to create this sandwich. The size reminded me of those weird French Toast sticks. I could tell it was basically a sandwich cut into fours, but I didn’t really care. Oozing cheese on grilled bread makes me happy and these were pretty tasty dunked in the cup of tomato bisque that accompanied them. My only complaint would be that I thought it was cooked a little too long and I tasted more bread than cheese. All thoughts of grilled cheese were dissipated when we got this Macaroni and Cheese placed before us. This is the reason we came back a second time so quickly. It’s a good reason, if you ask me. We found out from Kyle that the macaroni and cheese is made with cheddar, gouda, and brie. There’s also bits of pancetta throughout the dish with a really wonderful panko (maybe more than panko?) crust on top. 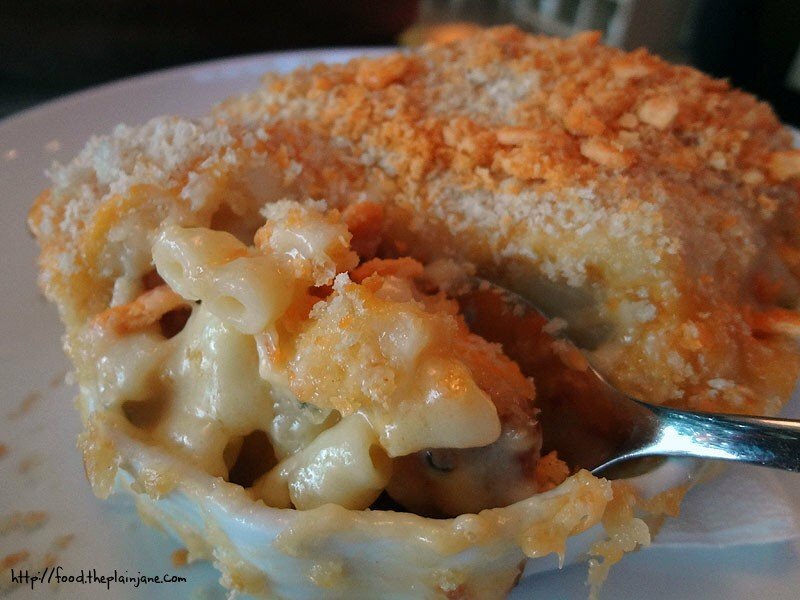 The cheeses blend together so well, giving a richness to the macaroni without going crazy overboard. The pancetta breaks it up just a tad and the crunchy topping gives it an added texture that just made me fall in love with this dish. Kyle told us it sells out regularly since they put it on the menu not too long ago. I could see why. 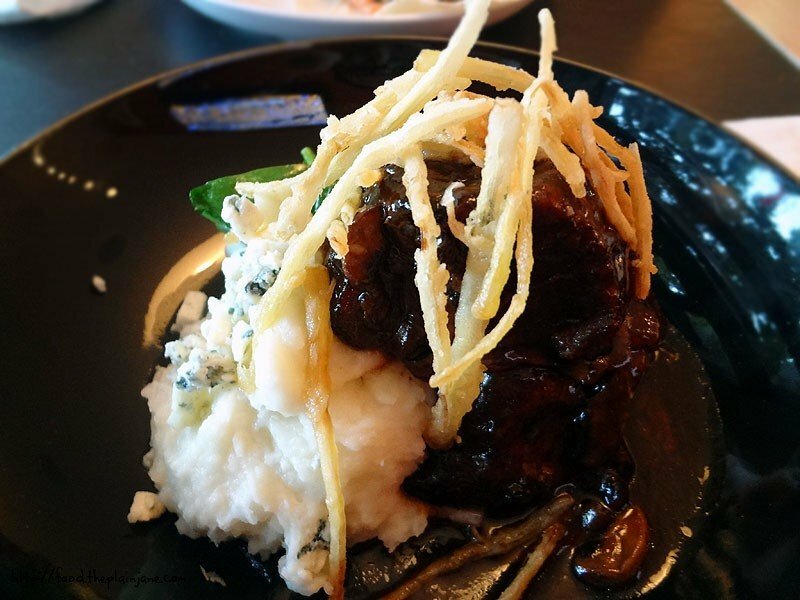 Also on our first visit, I ordered the “meat and potatoes” – a short rib in a very rich au jus with blue cheese smashed potatoes. Hiding on the other side of this place was a spinach and leeks side dish. The short rib was very tender and flavorful – the au jus was maybe just a little too strong for me, but I’ve always been like that. I wish the sauce has been on the side since it was overpowering to me, but Jake loved it and the sauce. The smashed potatoes were a real winner to me, with just a crumble of blue cheese. It was done well – not too overbearing and just enough blue cheese to flavor it but not kill the taste of the smashed potatoes. I’d probably like to just order blue cheese smashed potatoes as a side dish, if I could. Jake ordered these Spicy Beef Tacos – the only change he made was to put the avocado on the side since he doesn’t like avocado. That works well in my favor though, since I totally got to eat it. He decided that he should try the dish the way the chef intended it to be prepared, even though it has evil things like “salsa” and “coleslaw” on it. He ended up loving this dish so, so much. He loved the flavors of the tacos, how the beef was cooked just right, and how all of the ingredients formed together to create a particular flavor profile for the tacos. I dug how it was sort of twist on traditional tacos. The other thing I love about this place? The complimentary dessert with an entree. 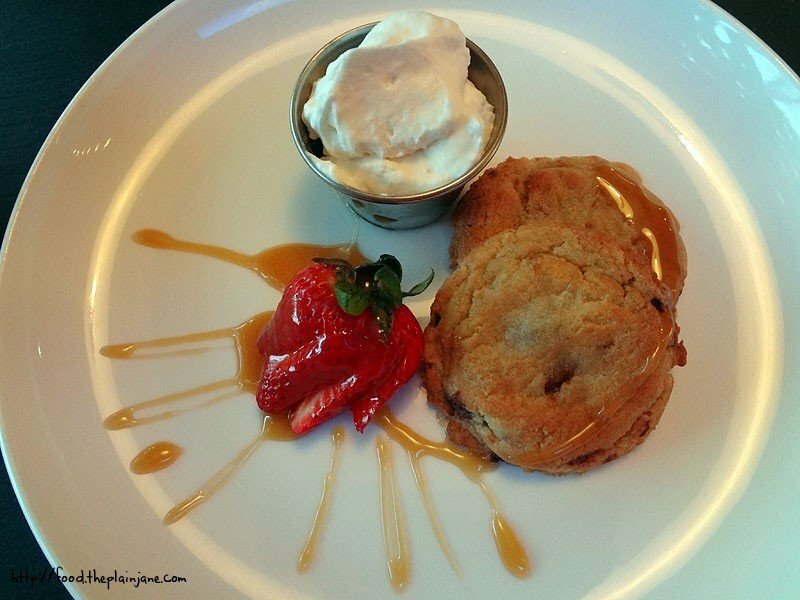 Freshly baked chocolate chip cookies with caramel sauce, fruit, and fresh whipped cream. Warm and luscious, the only sad thing is that you only get one cookie. As our waiter Kyle said, “they’re stupid good”. On our second visit with Laura in tow, I decided to order this extra appetizer (in addition to the macaroni and cheese, of course) and I knew Laura wouldn’t mind sharing. 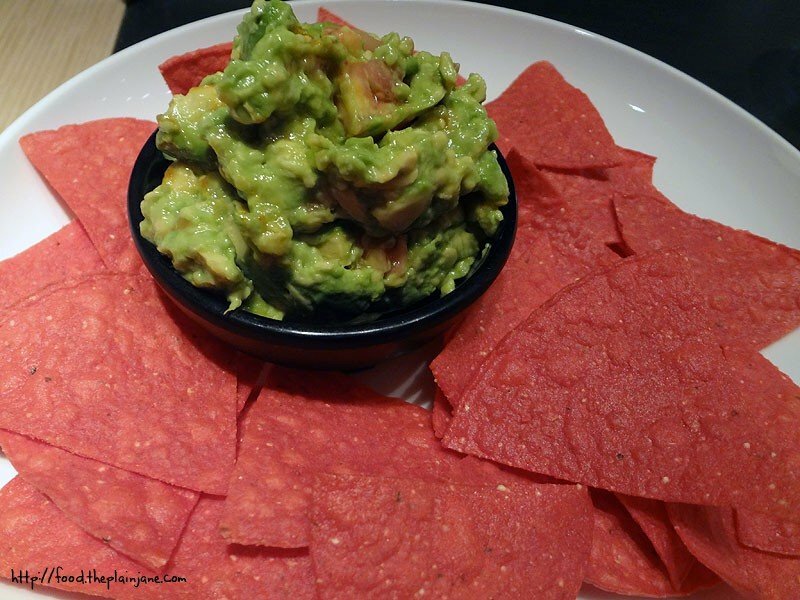 Love the color contrast with the bright red chips and the bright green dip! The sriracha sauce gives a bit of spice and a slight kick of heat to the dip. The chips were freshly baked – when we asked for more chips, we had a slight wait as they made up another batch for us. 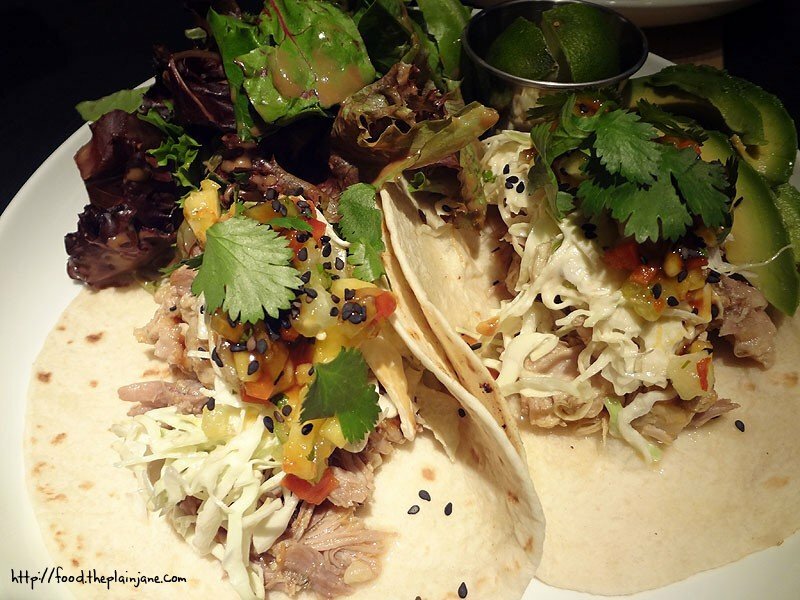 Jake was very tempted to get the same thing, but he opted to try their other tacos – the pork confit tacos. I don’t remember how they tasted since I only had a small bite, but he enjoyed these a lot, too. 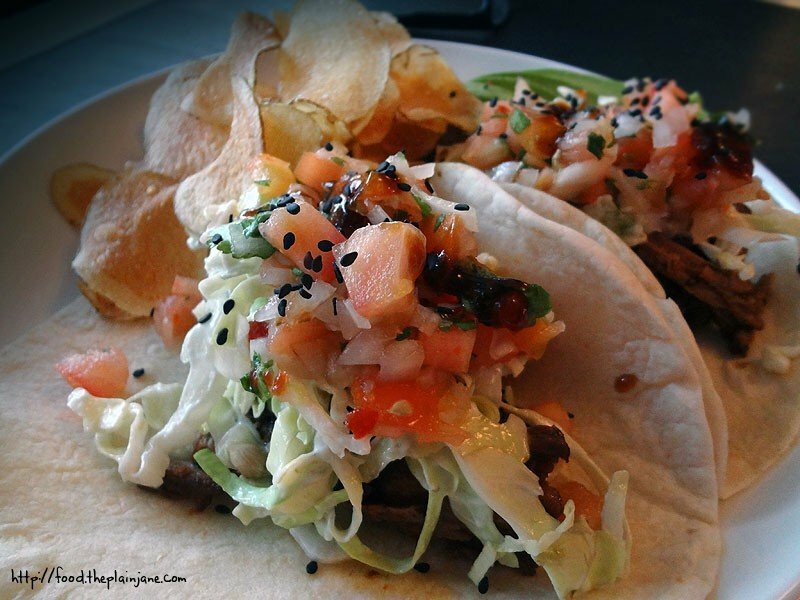 Of the two dishes though, he preferred the spicy beef tacos to these. 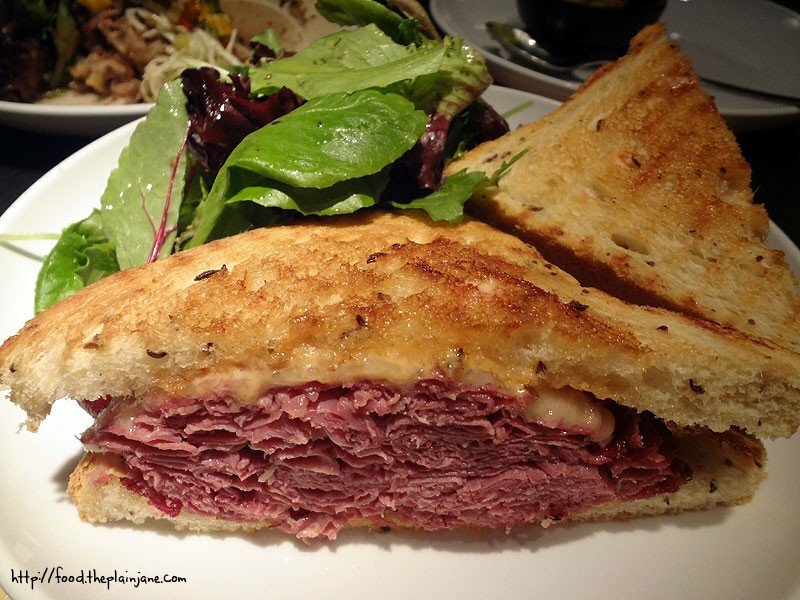 Laura ordered the Uptown Rueben, minus the sauerkraut. 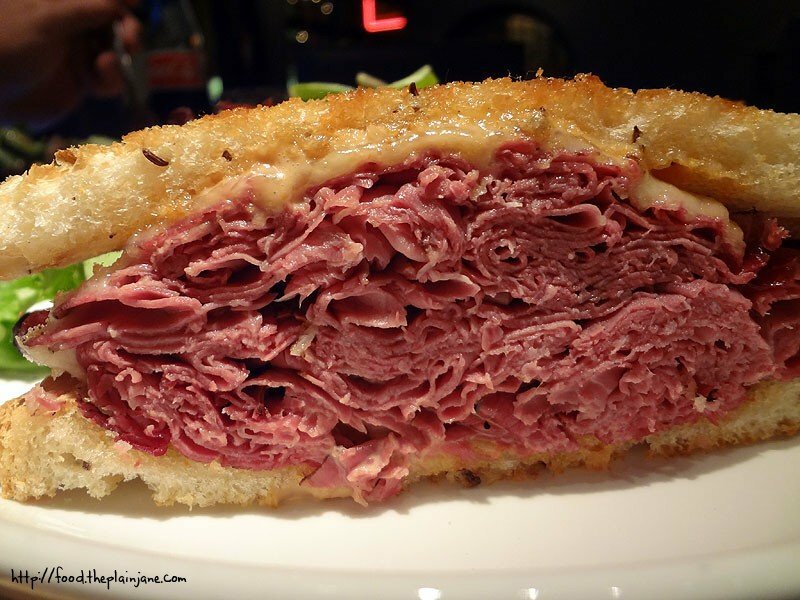 This sandwich was packed with pastrami! She gave me a little pastrami to try. It had a really nice, sort of mellow flavor and I was happily surprised that it was not super salty. Most of the pastrami I’ve had seems to be way too salty, but this one was just right. Me? 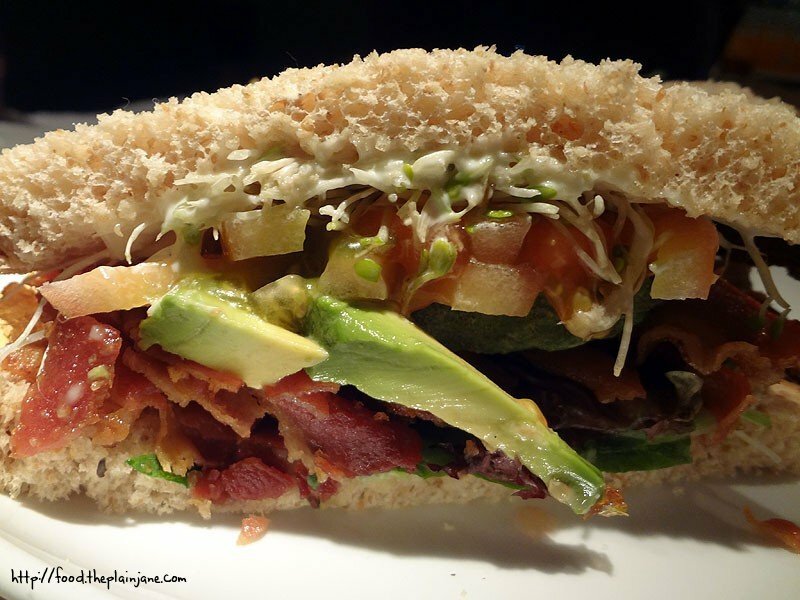 I ordered the BLAT. It wasn’t even toasted and I loved it! The garlic mayo made a heck of a difference here and there’s like a really small amount of sprouts. It’s not listed as an ingredient, but you can see them right there in the profile. They sort of added a hint of an earthy flavor to the sandwich. Usually I can’t stand sprouts, but I guess I do like them – but only in small portions. 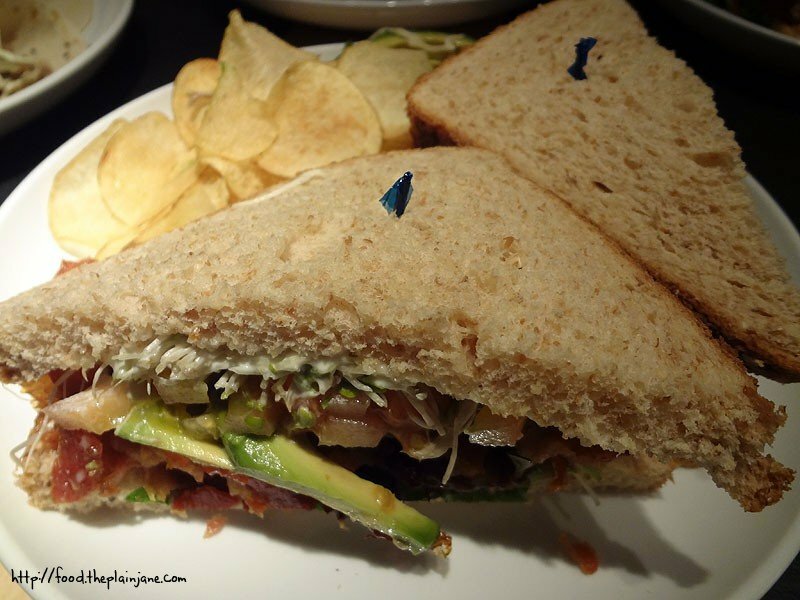 The bacon was delicious, the avocado very fresh and the veggies just made it a knockout sandwich. On our last visit (last weekend) they were still in the process of obtaining their liquor license, so booze is on the horizon! Also, if you check in via Facebook or Yelp, you can get a 15% discount on your meal. Don’t forget about those cookies, either! Jake and I love this place. We hope you can go visit it soon! I loved this place too! Am planning on going back soon with friends. I love it – I’m sure we’ll be back a few times!